Target Snapper, Pearl Perch, King Fish, Amber Jack and other quality table fish. Heading South to areas off Pt Lookout known as the Cathedrals which consists of large canyons and drops offs. Fish the Brisbane wave rider buoy for Dolphin Fish. Heading North to Square Patch, Deep Tempest and the top end of Moreton Island. These areas undoubtedly offer some of the most productive fishing South East Queensland has to offer. Includes coffee and toast on arrival, Aussie BBQ (sausage sizzle),smoked ham and salad rolls, fruit platter, biscuits, icy cold soft drinks and bottled water. Day charter departs 4.30 am (5.00 am May, June, July and August) returning approximately 1.30 pm for individual bookings, private trips by arrangement. or sit back and relax as the electric reels do the work deep drop fishing for giant Bass Grouper, Bar Cod, Flame Snapper and the much sought after Blue Eye Trevalla. Ham and salad rolls, fruit platter, biscuits, icy cold soft drinks and bottled water. Excited about booking your Brisbane fishing charter. 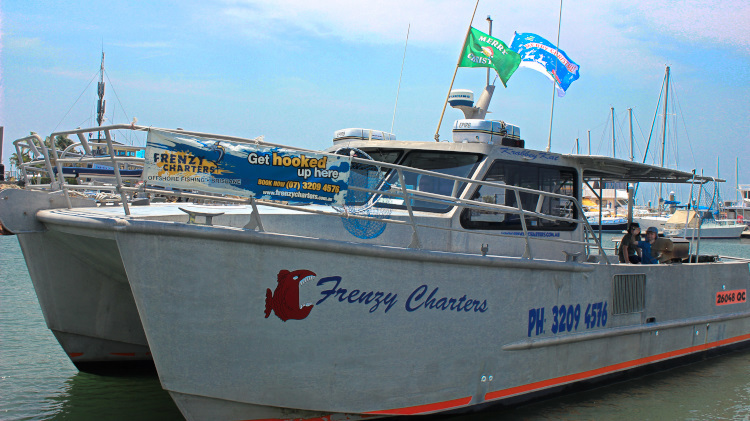 At Frenzy Charters we tick all the boxes, catering for the novice through to the most experienced fishers. Our full day mixed group charters target Snapper, Pearl Perch and quality reef fish. Action packed private Brisbane fishing charters are tailored to your requirements, may include reef, game and shark fishing. New to the south east coast of Queensland, guests have the opportunity to fish the hidden depths of the continental shelf. Suited for all but not your usual hands on fishing charter, target giant Bar Cod, Bass Grouper,Flame Snapper, Hapuka and the much sought after Blue Eye Trevalla, usually only experienced by professional fishermen. We utilise two heavy duty electric reels and when sea conditions permit, braided lines can be shared amongst guests while fishing waters ranging in depths from 200-600 metres. Reef and Game fishing can also be incorporated into this 12 hour tour. Our competitors all claim to have the biggest, fastest and best of everything. This all means nothing if you are not where the fish are. Our Brisbane based fishing Charters depart from: Wyvernleigh Close Manly (William Gunn Jetty) at the heart of Brisbane and only 60 minutes North of the Gold Coast. Departing at 4.30 am (5.00 am May, June , July and August) we meet at the William Gunn Jetty, Wyvernleigh Close Manly. Pick up available Stradbroke Island (Amity Point jetty) and Moreton Island. Late comers miss the boat. After we load your gear on the boat, guests are signed on and a full safety briefing is given by the crew. Also discussed are the weather conditions, latest catches and guests expectations. ie reef fishing, game fishing, live baiting, trolling, float lining and species sought. Enjoy coffee and toast as we set out across the sheltered waters of Moreton Bay, out through South Passage bar to the open sea. Total travelling time may be as little as 1 hr 15 min or around 2.5 hrs for continental shelf trips. Trolling lines are often deployed on the way out and between fishing spots. During the winter months we target Snapper, Pearl Perch, Amberjack, King fish, Teraglin Jew. As we move into summer Marlin, Dolphin Fish, Tuna, Shark, Mackerel, Sail Fish and Wahoo may be caught. Much of what we do depends on the weather, wind direction and speed, as well as current direction and speed. All these play a critical role in the success of the day, therefore we are always ready to change our tactics to match the prevailing conditions. I DON'T sit around all day waiting for the fish to bite, I'll give it my best shot at what I think we should do. For both myself and the crew, job satisfaction comes from putting our guests onto fish. On full day fishing charters we usually head in around 1.00 pm (depending on how far we travelled). Your catch is placed in ice slurry on capture to avoid any risk of spoiling, fish are kept whole (not gutted) and prepared for cooking at home. All day free soft drinks, bottled water. SHOULD I USE A CHARTER BOAT? Charter boat web sites and brochures are loaded with pictures of fish to wet your appetite, but this is not a true representation of every day we fish. As owner operators, we do what we can to put our customers on fish, this is what pays expenses and keeps people coming back. But the reality is that there are days when fish just don't want to play the game and there is nothing that can be done about it. Fishing is great fun, just some days more than others.